Providing you the best range of pet bottle blow molding machine and stretch blow moulding machine with effective & timely delivery. We provide our clients with a range of pet blow molding machine and bottle blowing machines, which are used to manufacture the bottles of any possible geometrical figures. Our range of blow molding machine is used for PET bottles ranging from 30 ml to 2000 ml. These are fabricated using high grade material and cater to the requirements of various industries. Best known for effective performance and high efficiency, our range is offered at market leading rates to our clients. 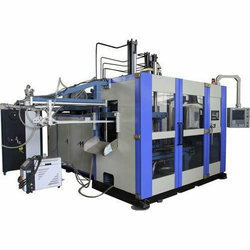 4 Cavity Bottle Blow Molding Machine Capacity 1300-1400 Bottles/Hr. Capacity:- 30 ml to 2000 ml. The Canadian Crystalline system is well known for its solidity and reliability according to world standards. A simple system to operate means short training for operators. As the machine requires very little maintenance, cost related to non operating machines are negligible. Our organization deals in manufacturing of wide range of Pet Bottle machine as per our valued customers specifications and requirements. These highly acclaimed automatic bottling machines are widely used in various industries for packaging purpose. We offer these automatic bottling machines in various dimensions and sizes. Moreover, we also customize these machines on the specifications laid by our valuable and trusted clients.